Dominion Dealer Solutions have introduced ShopMyPayment to dealerships, which allows consumers to have more control over the shopping process without having to leave the dealer's website. Google identifies 19 digital research touchpoints for auto purchasers. With ShopMyWay, dealer groups can instead make theirs the only one. Dominion Dealer Solutions, provider of industry-leading automotive responsive websites, has introduced ShopMyWay for automotive retail dealerships nationwide. ShopMyWay is a suite of shopping tools designed to enable the car buyer to control the shopping and research processes. It allows consumers to not only search a dealer group’s entire inventory based on specific features or preferences, but also compare those vehicles side by side. Additionally, online car shoppers can view the value of a current trade and ascertain which vehicles can be purchased based on prequalified credit. Dealer groups have searched for a way to maximize their businesses’ entire inventory online, facilitating online shopping and directing traffic to their own websites. Dealers also need an environment where they can provide information to high or mid-funnel shoppers, empowering them to shop for vehicles based on their own needs. ShopMyWay captures these high and mid-funnel shoppers and creates engagement opportunities with them. These shoppers typically search 3rd-party or OEM websites for the same information that ShopMyWay now lets them view right on the dealership’s website. With ShopMyWay, dealers can further connect with these shoppers without redirecting them to an automotive portal or manufacturer website. “This is a first of its kind solution that allows a dealer group to provide consumers with the automotive shopping experience they always wanted," noted Nicole Case, general manager for Dominion Dealer Solutions. ShopMyWay provides an end-to-end, consumer-driven shopping experience. 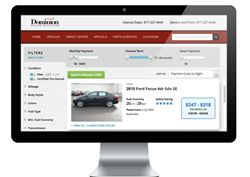 The sites are easy to use for vehicle, trade and payment-oriented automotive shoppers. Consumers can search the entire dealer group’s inventory by payment preference and look at detailed, side-by-side vehicle comparisons. Without consumers having to leave the dealer group website, the full-service trade valuation tool lets them pre-qualify for credit and payments so dealerships can efficiently follow up. In addition to providing a singular digital resource for car buyers conducting research on a dealer group website, ShopMyWay reduces the dependence and money spent on 3rd-party automotive sites while driving high-quality appointments directly to the dealership. Instead of the dealer group website acting as a directory, ShopMyWay makes the site a destination for consumers, using the same science-driven responsive website design behind Dominion’s websites. Dominion Dealer Solutions helps car dealers attract, retain, and service customers for life. Dominion's Progressive Retail Solutions include customer relationship (CRM) and dealer management systems (DMS) with actionable intelligence from the Microsoft Dynamics platform. Dominion’s Progressive Retail Solutions also feature lead management and equity mining technology, inventory management analytics, social media marketing and reputation management solutions. Dealers nationwide purchase custom lead generation and digital marketing tools from Dominion including: responsive design websites, SEO, SEM, digital advertising, multi-channel marketing, specialized data aggregation, mobile apps and market reports. OEMs and auto dealers nationwide utilize Dominion Dealer Solutions' technologies to solve their marketing challenges. Dominion Dealer Solutions is redefining automotive retail by delivering first-class customer experiences for local car buyers. For more information, visit our website, like us on Facebook, Pinterest or YouTube, or follow us on Twitter. Dominion Enterprises is a leading marketing services and publishing company serving the automotive, recreational and commercial vehicle, real estate, apartment rental, parenting, and travel industries. The company’s businesses provide a comprehensive suite of technology-based marketing solutions including Internet advertising, lead generation, customer relationship management, website design and hosting, and data management services. The company has more than 45 market-leading websites reaching more than 20 million unique visitors monthly. More than 77 million For Rent®, and HotelCoupons.com® publications are distributed nationwide each year. Headquartered in Norfolk, Virginia, the company has 3,300 employees in more than 145 offices in the United States, Canada, England, Spain and Italy. For more information, visit DominionEnterprises.com.